Perhaps you own a small print shop and are looking to expand your services, or you are new to the market and are considering buying an existing wide-format business or starting one from the ground floor up. Whatever your situation, there are a number of points to consider and a lot of homework that needs to be done before putting up your “Open for Business” sign. Buying an existing shop requires less work in start-up costs and finding a location. Starting a wide-format business from scratch will take more time, but it could allow you more flexibility in choosing a location, equipment and the work you want to produce. 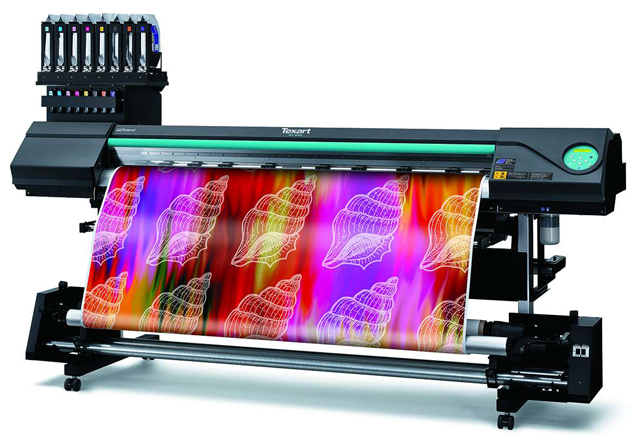 The CET Color Q5-250h UV hybrid printer offers media versatility and space-saving architecture. The first thing you need to do is create a business plan. This plan should have an ROI (return on investment) model. Create a spreadsheet and a letter explaining the new business plan. Include actual numbers with a timeline that shows how, in time, the business will start to make money. The business plan should review the basics such as payroll, rent, overhead (electric, heat, etc. ), marketing, capitol (equipment), future expansion, expected material costs, vehicles, and anything else needed to make the business successful. Dave Conrad, director of sales and marketing, Mutoh America, Phoenix, Arizona says the business plan should look at basics like market strategy, competitive analysis, a SWOT analysis (strengths, weaknesses, opportunities, and threats), short- and long-term goals and what you will do to attain them. CET Color’s Q5-500 4' x 8' UV-curing flatbed printer provides the latest Ricoh printhead technology with 1,280 nozzles per head. Should You Buy or Lease Your Location? Javier Mahmoud, vice president of sales and marketing at CET Color, Atlanta, Georgia, declares that depending on cash flow, if you can buy a brick and mortar location … buy. 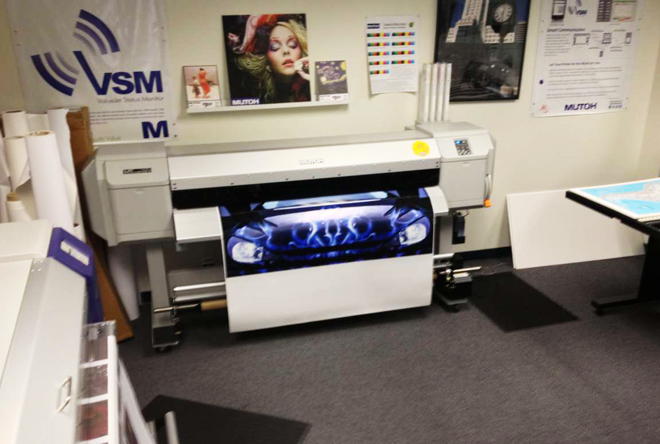 Alphagraphics, a shop in Roseville, California, recently installed this Mimaki JFX200-2513, a 4’ x 8’ UV-curing flatbed printer flatbed offering durable prints for both indoor and outdoor use. 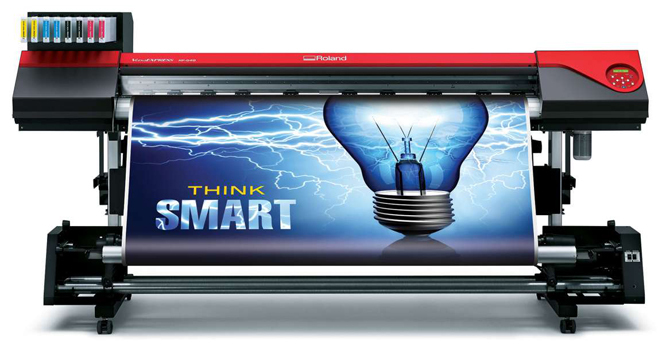 The Mimaki UCJV300-160 is a versatile UV-LED inkjet printer with the combined functions of both printing and cutting. Should You Buy or Lease Your Equipment? “Because equipment tends to go down in value over time, most people lease. Unless you’re a not-for-profit organization, most shops will lease,” notes Mahmoud. Michael Maxwell, senior manager, Mimaki USA, Suwanee, Georgia, says they see leasing as the preferred method of financing because it enables customers to protect their cash, overcome budget limitations and acquire the right printing equipment for existing jobs as well as future growth. 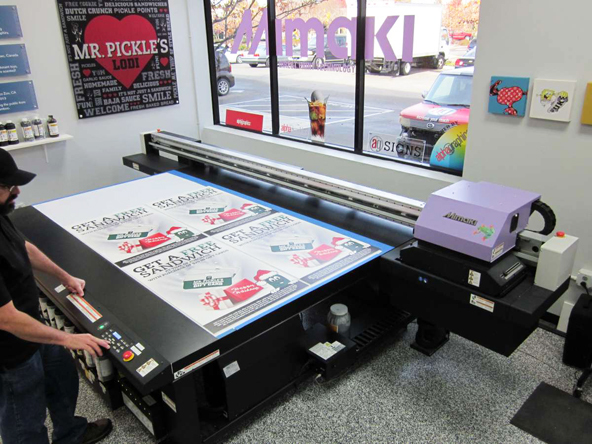 “Mimaki Financial Services offers affordable monthly payment plans that can be customized to meet almost any budgeting needs," Maxwell says. "A comprehensive online Resource Center provides the tools necessary for pre-approval, credit decisions, document preparation and contract commencement. Customers will know within hours—rather than days—of their credit approval status,” he explains. Depending on the type of business and the markets you plan to serve, you may need to look at a variety of printers with a variety of ink types, according to Mutoh's Dave Conrad. Conrad notes its best to buy for next year. 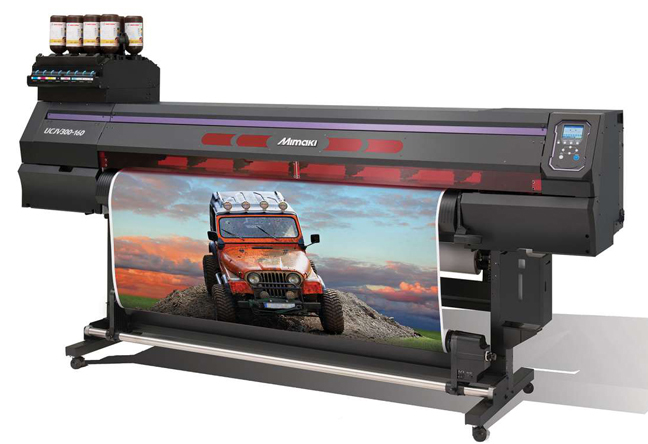 “If you are setting up a sign shop to print banners and displays, but know you’ll be growing into vehicle wraps a year from now, don’t skimp on the 54-inch printer when you really need a 64-inch wide printer. Stepping over nickels to pick up pennies is not a good habit to get into. If you have the ability to finance with a good program or if you have the extra capital, be sure to invest in the equipment you need now that will also handle expected output demands over the next year or three so you are not struggling to keep up with client projects,” he explains. What Types of Printers Should You Look at and Why? “If you don’t already have a roll-to-roll type printer, invest in a hybrid. This will satisfy both flat goods (substrates) as well as roll printing such as banners,” explains Mahmoud. 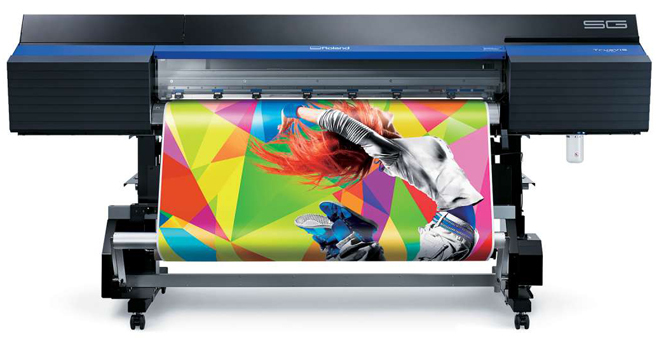 Buyers may want to consider purchasing a quality dye-sublimation printer, such as Roland’s Texart RT-640, to decorate soft signage, apparel, hard goods with vibrant, eye-catching graphics. What Finishing Equipment is Needed? 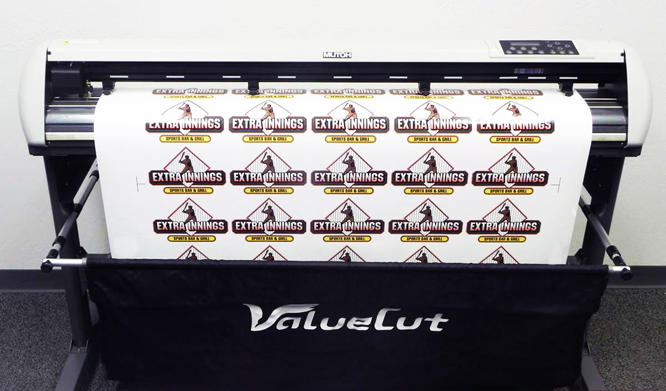 “Eco-solvent printers pair up nicely with cold or heat-assist roll laminators for car wraps, mounting and other simple finishing applications,” explains Conrad. “Most folks have a laminator, a flatbed cutter and some form of stitching option,” says Mahmoud. When Can You Expect to Make a Profit? Maxwell says that there’s great variance and too many components to provide a comprehensive answer. Location (overhead costs), labor rates, financing, machine and ink type, consumables, software, media, finishing, etc., can affect production costs to varying degrees. “Low cost-of-entry doesn’t always translate into better value because of hidden consumables, service or other printer-related expenses,” he says. highest demand, says Daniel Valade. What is the Estimated Cost of Entry? “In most cases, a shop can get started with about a $50,000 investment in equipment,” Valade notes. That would include a printer/cutter (or a printer and stand-alone cutter), a laminator, a heat press (for dye-sublimation applications) and any other required hardware,” he adds. 康拉德说：“你可以买到54或64台打印机、贴膜机、RIP软件、乙烯基、横幅和层压板等创业标识材料、你的电脑/显示器、墨水和材料，价格在40-5<span style="font-size: 16px; font-family: 微软雅黑, "